The new multi-gym Plus of Kettler is the development of the well-known Multigym. This module is upgraded by the 3D-Flex-Motion system. Do free cable pull exercises with the lateral arms and hence benefit from more diversion for your training. Besides a multitude of training exercises, the free exercises on the cable pull offer another advantage that the course of motion is free and hence more muscles are challenged. Compared to guided exercises, you have to keep the balance independently while doing free exercises. Besides the mainly stressed muscles, the supporting muscle groups also have to compensate it actively and are directly trained as well. Offering a height of exactly 2 metres, the Multigym is also well suitable for low ceiling heights, for instance in a cellar. The set-up dimensions of 181 x 156 cm is also compact. However, you should plan enough space to the side for the training with the 3D-Flex-Motion system. The weight block of 80 kg offers sufficient resistance for the most home sportsmen doing their diverse pull and push sessions. However, the Multigym might be small but it still allows enough exercises for a diversified strength training at home. The Kettler Multigym Plus is ideal for the training of all muscle groups. The multi-gym includes a lat module, allows bench press exercises, butterflies or rowing with both hands. 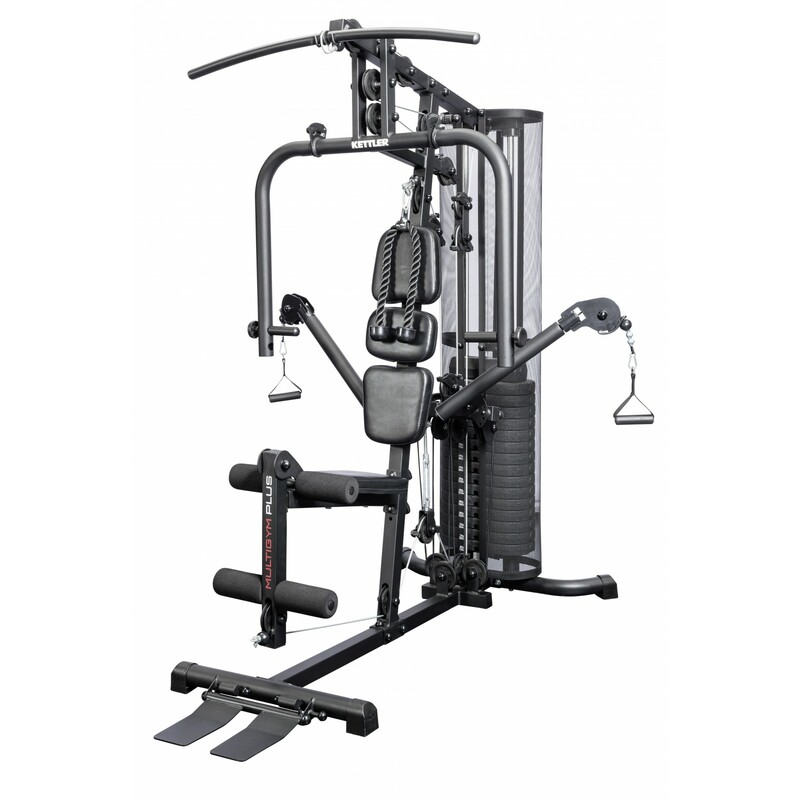 In addition, the multi-gym is equipped with a cable pull module for the triceps training and diversified exercises for the abdominal muscle training and the muscle building. Moreover, the described 3D-Flex-Motion system with its versatile use options is included as well. The multi-gym has a back upholstery, which is divided into three parts, and a height adjustable seat in order to make the strength training at home comfortable. Kettler Multigym Plus add to comparison list.